The UN Security Council on Monday unanimously approved new sanctions on North Korea in a watered-down resolution that eliminated a ban on all oil imports and an international asset freeze on the government and leader Kim Jong-un that the Trump administration wanted. The resolution does ban North Korea from importing all natural gas liquids and condensates. But it caps Pyongyang’s imports of crude oil at the level of the last 12 months, and it limits the import of refined petroleum products to two million barrels a year. 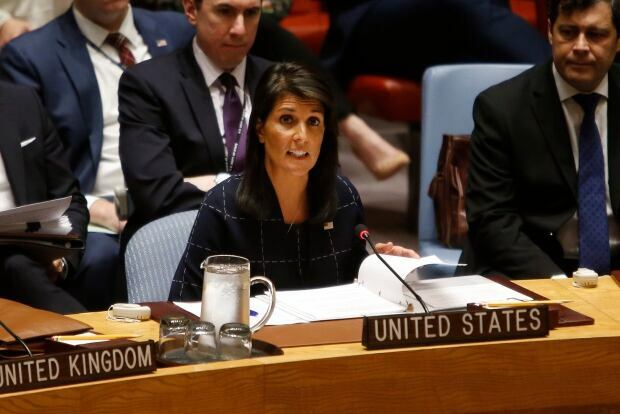 Haley reiterated that the United States does not want war and said “North Korea has not yet passed the point of no return.” She said if Pyongyang gives up its nuclear program and proves it can live in peace, the world will live in peace with it. The resolution represents a swift response to North Korea’s sixth and strongest nuclear test explosion Sept. 3, which it said was a hydrogen bomb, and to its escalating launches of increasingly sophisticated ballistic missiles that it says can reach the United States. The text was agreed to after final negotiations between the U.S. and China, the North’s ally and major trading partner. Haley praised the “strong relationship” between President Donald Trump and Chinese President Xi Jinping for enabling the resolution’s adoption. But its provisions are a significant climb-down from the toughest-ever sanctions that the Trump administration proposed in the initial draft resolution it circulated last Tuesday, especially on oil, where a complete ban could have crippled North Korea’s economy. According to the U.S. Energy Information Administration, China supplies most of North Korea’s crude oil imports, which a U.S. official put at four million barrels a year. 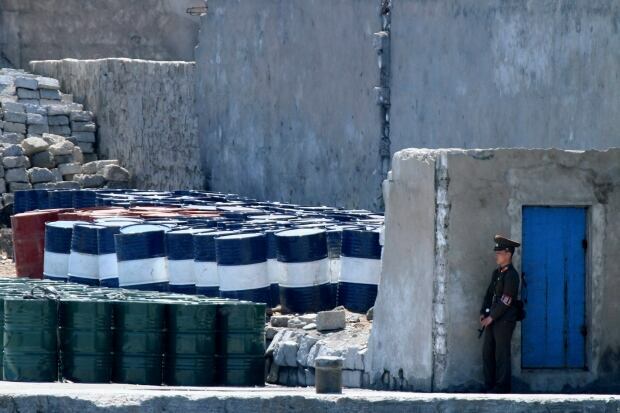 The agency cited UN customs data showing that China reported sending 6,000 barrels a day of oil products to North Korea, which it said is mostly gasoline and diesel fuel vital to the country’s agriculture, transportation and military sectors. That would mean North Korea imports nearly 2.2 million barrels a year in petroleum products, so the two million barrel cap in the resolution would represent a 10 per cent cut. But the U.S. official said North Korea now receives about 4.5 million barrels of refined petroleum products, which would mean a more than 50 per cent cut. The textile ban is significant. Textiles are North Korea’s main source of export revenue after coal, iron, seafood and other minerals that have already been severely restricted by previous U.N. resolutions. North Korean textile exports in 2016 totaled $752.5 million US, accounting for about one-fourth of its total $3 billion in merchandise exports, according to South Korean government figures. The U.S. official, speaking on condition of anonymity ahead of the council vote, said the Trump administration believes the new sanctions combined with previous measures would ban over 90 per cent of North Korea’s exports reported in 2016. As for North Koreans working overseas, the official said the U.S. expects the cut-off on new work permits will cost North Korea about $500 million a year once current work permits expire. The U.S. estimates about 93,000 North Koreans are currently working abroad, the official said. The original U.S. draft would have ordered all countries to impose an asset freeze and travel ban on Kim Jong-un and four other top party and government officials. The resolution adopted Monday adds only one person to the sanctions list — Pak Yong-sik, a member of the Workers’ Party of Korea Central Military Commission, which controls the country’s military and helps direct its military industries. The original U.S. draft would also have frozen the assets of North Korea’s state-owned airline Air Koryo, the Korean People’s Army and five other powerful military and party entities. The new resolution drops sanctions on the airline and army and would only add the Central Military Commission of the Workers’ Party of Korea and the party’s powerful Organization and Guidance Department and its Propaganda and Agitation Department to the sanctions blacklist. 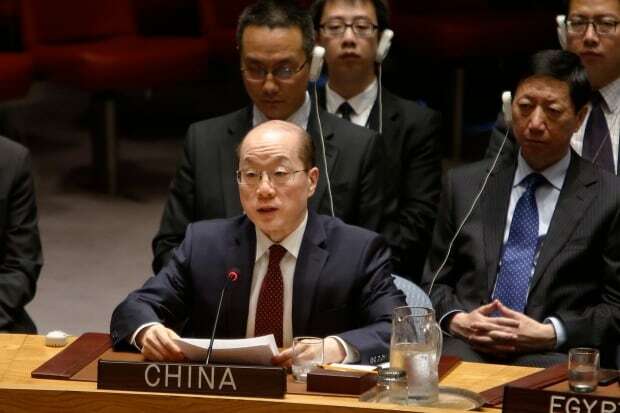 China and Russia had called for a resolution focused on a political solution to the escalating crisis over North Korea’s nuclear program. They have proposed a freeze-for-freeze that would halt North Korean nuclear and missile tests in exchange for the U.S. and South Korea stopping their joint military exercises — but the Trump administration has rejected that. Russia argues that sanctions aren’t working and President Vladimir Putin expressed concern last week that a total oil cut-off could hurt the North Korean people. As U.S., North Korea escalate war of words, could Putin be a voice of reason? It retains language on the council’s “determination to take further significant measures” in the event of a new nuclear test or ballistic missile launch.